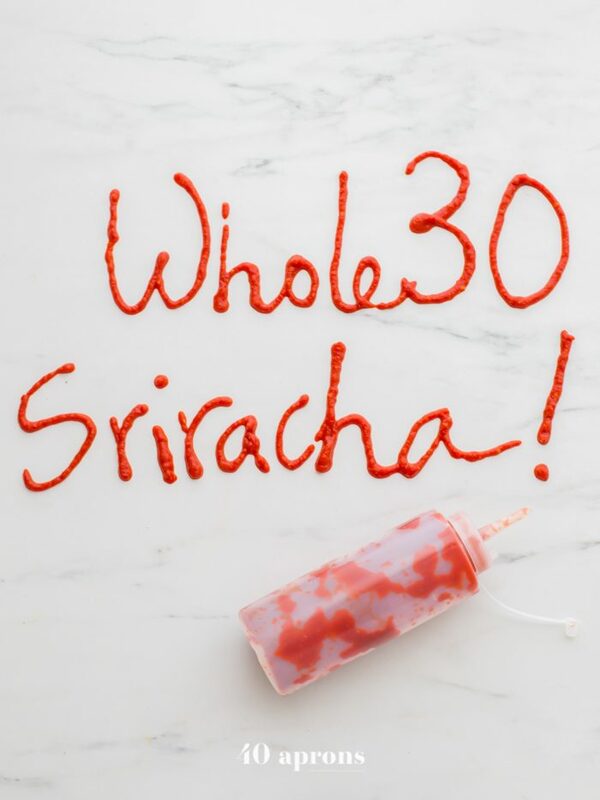 This Whole30 sriracha is totally Whole30 compliant and perfectly spicy and garlicky. Made in minutes with only a few ingredients, this Whole30 sriracha belongs in every Whole30 fridge for sure! 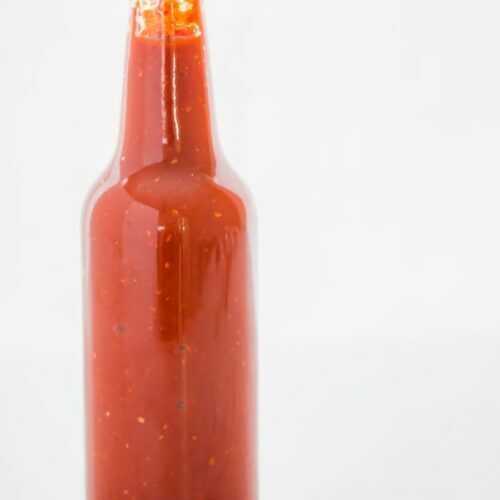 Sugar-free and with zero preservatives, this Whole30 sriracha is fantastic fermented, as well, making it even healthier. You know what was a bummer? When I realized, during my very first Whole30, that every. sriracha. out there. had sugar. I was stuck with Frank’s Red Hot if I wanted to spike my food with hot sauce, and, though I love a good vinegar-based hot sauce here and there, it just doesn’t cut it in Asian recipes, drizzled sloppily over zucchini noodles, stirred into my Whole30 Instant Pot pho… Nope, you gotta have sriracha for that. But I’d always thought of homemade sriracha as beyond me. Like, what even happens that creates such magic? Surely I’m no alchemist, and I’d leave my green-capped bottle for day 31. 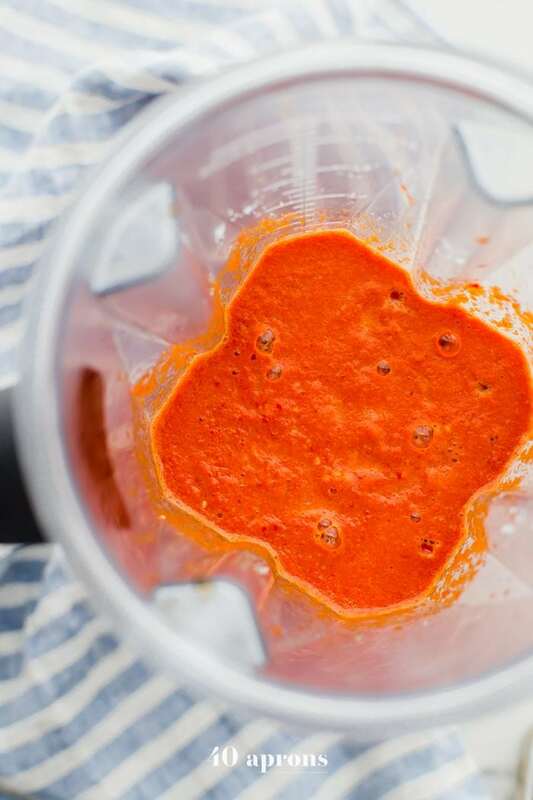 And then I looked up a few non-Whole30 sriracha recipes and realized it was simple AF and changed our lives forever with one whir of the blender. So here’s how making Whole30 sriracha works: you blend up an absolute load of red jalapeño peppers with some garlic and a bit of coconut aminos (for a bit of that natural sweetness that you always see in other sriracha recipes). You can let it ferment for a few days, because gut health is kind of my obsession, or funnel it straight into jars. Then? Drizzle freely and often, taste test directly from the spoon, curse me later. Thank me later later. And I feel like that description leaves me with no reason to convince you on the Whole30 sriracha itself: spicy, garlicky, and that spicy garlickiness balanced with the teeny tiniest bit of natural coconut amino sweetness. It’s not as shockingly hot as you might think it’d be, and it goes positively beautifully in dishes like my Whole30 egg roll in a bowl or Whole30 lettuce wraps. It makes a ton, too, and for something like $2.19! Yeah… $2.19 for two giant bottles of Whole30 sriracha. 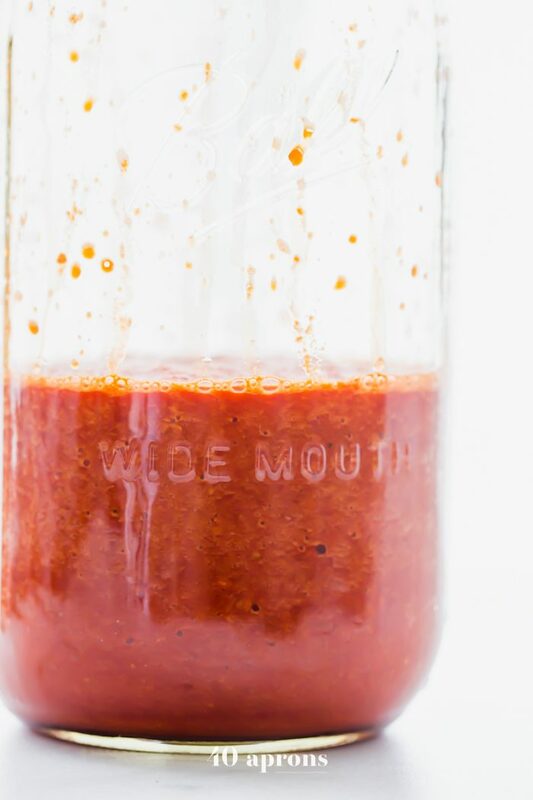 Whole30 sriracha that’s fresher and healthier (especially if you ferment it) than any other sriracha out there. $2.19 for Whole30 sriracha that’s positively heavenly with the garlic and the chiles and the Whole30 compliance. Drizzle it on eggs, on simple stir-fried chicken, on all the veggies ever. 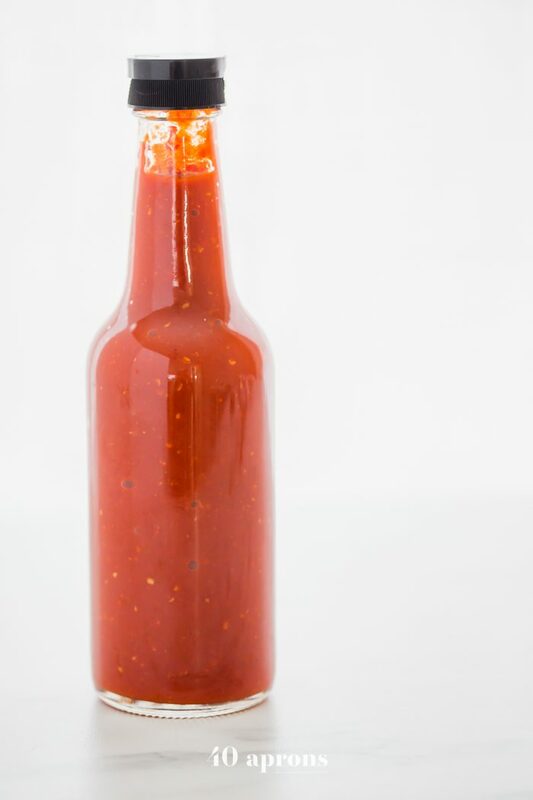 You just need this Whole30 sriracha in your life (and permanently in your fridge). And considering how insanely easy and cheap it is to make, you’ve got no excuses, sister. If fermenting: Place all ingredients except vinegar in a high-speed blender. Pulse a couple times to chop, then turn blender on. Increase speed to high and blend until mixture is completely smooth and liquid. Pour mixture into a large glass jar. Cover mouth of jar with a kitchen towel and wrap a rubber band around the mouth to secure it. Place jar in a cool, dark location for 3 to 5 days, stirring once a day. By day 3-5, the mixture will begin to bubble and ferment. When you see these bubbles, transfer mixture back to blender and add white vinegar. Blend again until very smooth, then strain mixture if desired. Pour into serving jars and keep in fridge. If not fermenting: Place all ingredients in a high-speed blender. Pulse a couple times to chop, then turn blender on. Increase speed to high and blend until mixture is completely smooth and liquid. Strain mixture if desired. Pour into serving jars and keep in fridge. I was having a hard time finding red jalapeños, BUT Trader Joe’s actually sells a hot sauce that is just red jalapeños, distilled vinegar, and salt (called Jalapeño Pepper Hot Sauce). I popped the top off, poured it into a cup, added crushed garlic and coconut aminos, stirred, and poured it back in the bottle. It’s awesome. Thanks for the recipe! Why fermenting? Does it last longer or is it just the benefit of fermenting? Also, I am trying to avoid white distilled vinegar because of the corn component-does apple cider vinegar work in it’s place? I am wanting to make your Bang Bang Shrimp recipe!!! Both! It lasts forever once it’s fermented but I mostly do it for the bonuses of fermentation. You can definitely use ACV in place of the white vinegar! This looks delightful! Just used store bought sauce and was thinking, “man, I’d love a Whole30 compliant sauce for the food freedom journey,” then I stumbled on your sushi post. Can’t wait to try – you have wonderful recipes! I know it’s optional, but do you prefer yours stained? Quite a long time! I wouldn’t recommend this but I swear we had a batch in our fridge for a couple months at one point – ha! 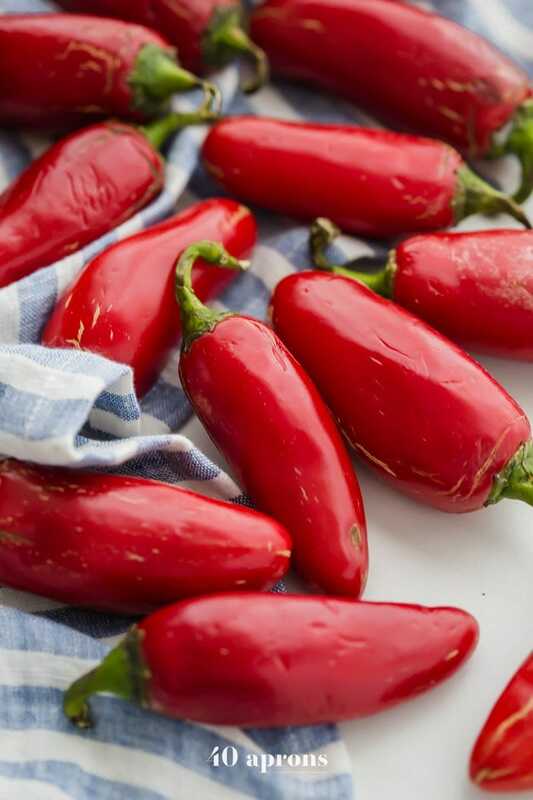 Where do you find red jalapeno peppers? I live in Michigan. I find them at the regular grocery store! My Krogers always have them. You can also try an international market if you have no luck at the grocery. What are your directions for fermenting this? It looks fantastic!